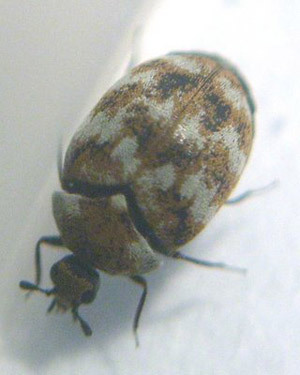 Varied carpet beetles (Anthrenus verbasci) are one of the more common species of carpet beetle. Varied carpet beetle larvae are brown, striped, 1/4 inch long and widest in the middle of their bodies. The adults are smaller, and round or oval in shape with mottled yellow, white and orange scales on a black body. The adult Carpet Beetle is not the evil-doer, it is the larvae stage (often called woolly bear) that you need to worry about. These scavengers eat carpet and other natural fibres and food sources including fur, feathers, silk, bone, horns and dead insects. The Carpet Beetles fly, have a life span of 2-6 weeks in spring/summer, they also feed outdoors on flower pollen and nectar. The beetle does no harm in the home, other than lay eggs onto katrin containing products ie: wool, fur, leather, silk and animal remains. Use Pheromone Traps for detection of adult beetles. Catch them before they mate then damage will be minimised. Carpet Beetle Control Pheromone traps should only be used between March-November as not many adults are expected to be around in December/Jan/Feb. Woolly bears are destructive to home furnishings, feeding on carpets and sometimes clothes. 4-5mm long, brown in colour and possess three bunches of golden hairs, arranged in pairs on the posterior abdominal segments. They avoid light and will roll up when disturbed. They have several moulting stages so you may find many larval moults. They can survive up to ten months and can live through the winter months. Treatment will involve the application of a residual insecticide to affected items (usually carpets). Do not apply insecticides to clothing. Check airing cupboards carefully as these are the main source of infestation. If you have bird nests in the roof, these can also be a source of infestation. Spraying Pro-Active C to all affected areas will gain good control, where you cannot use a liquid use Pro-Active Dust (safe and natural) liberally sprinkled throughout the area. If you suspect you have a carpet beetle infestation in Edinburgh, Glasgow, Aberdeen, Dundee or Perth, call GRAHAM pest control today and we could help.